Surah Fatiha is the most easy and memorize Surah in Quran. The Holy Book Quran is a priceless book for the Muslims. Each and every word of this holy book is of great worth for every Muslim. Surah Fateha has seven verses. It was revealed in Mecca as stated by Ibn Abbas, Qatadah and Abu’l-Aliyah. Surah Fatiha is the only Surah in Quran, which have 20 other names. “Whoever does not recite Sûrat Al-Fâtihah in his prayer, his prayer is invalid. (Sahih Al-Bukhâri, Vol.1, Hadîth No. 723). There are many benefits, the Muslims get by the recitation of this priceless book. Every Muslim has a natural affiliation with this Holy Book. The greatest Surah of Holy Quran is Surat Fatiha. In this post, I am going to disclose Surah Fatiha benefits. The nature of man demands keenness in every work before he starts it. He can get only that thing which he desires. Therefore, Allah almighty has made every Muslim to offer this dua for seeking the true and straight path. Later on, Quran will guide every Muslim to success and ultimately paradise. This reflects the fact that link of Quran and Surah Fatiha is like question and answer of a pray. During recitation, a Muslim prays to Allah for guiding and blessing him with grace. In return of this question Allah almighty answers in the form of whole Quran. One day an Angel came to Holy Prophet Muhammad (S.A.W) from heaven and say Salaam to Holy Prophet (S.A.W) and give Him glad tidings of two “noor” which never blessed to any other Prophet, One is Surat Fatiha and second is Surah Baqrah’s last verses. Surah Fatiha is a matchless Surah, revealed in Holy Quran. No one can find a match for this greatest Surah of Holy Quran. Allah did not reveal anything like this Surah in the Holy Books revealed before the Holy Quran. There are great rewards for those who recite Surat Fatiha. Muslims recite this Surah in every prayer. Indeed, our prayers are incomplete without the recitation of Surah Fatiha. This Surah has the summary of whole Holy Quran in it. One can understand the meaning of Quran by understanding this Surah. There are many names of this greatest Surah according to Surah Fatiha benefits. Recitation of this Surah is the best treatment to cure many diseases as one name of it is Ash-Shifa. To cure poison, this Surah is very effective. To get rid of poverty, one must recite this matchless Surah. It is helpful in removing poverty. The recitation of this Surah also brings new ways for its readers to clear debts by the mercy of Allah Almighty. To remain safe from the fear of enemies, one must recite this Surah. The readers of this Surah come under the protection of Allah, the greatest protector in this world. Recite this Surah regularly and get rid of all kinds of fears. This greatest Surah of Quran is a source of enlightenment for its readers. Reciting this Surah, one gets a way to get the favor of Allah. The Surah is really effective to light up the spirit of faith in the heart of a Muslim. Start your deeds with the recitation of Surah Fatiha and get help from Allah. After the 100 time Reciting of Surah Fatiha every pray will be surely assented. Hazrat Muhammad (Peace Be Upon Him) says: Surah al Fatiha is Cure from every illness. One of the biggest benefit of recite this surah is, In very pain recite Surat Fatiha the pain will vanished. 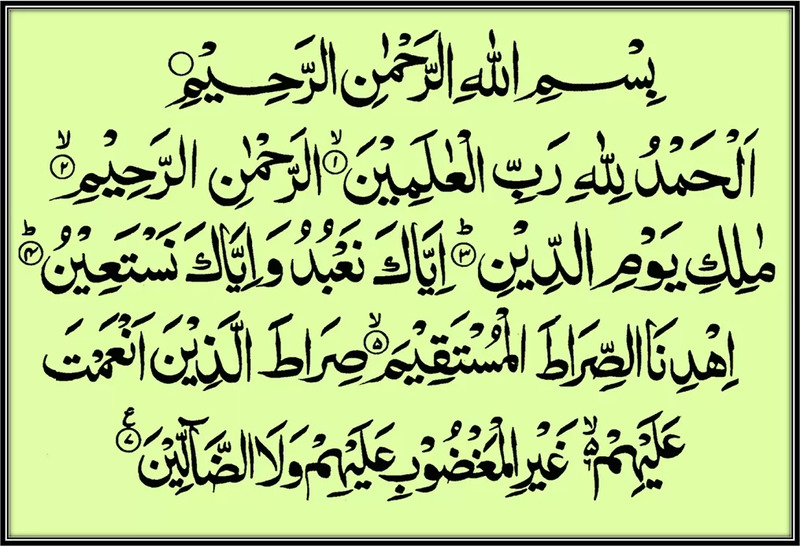 Three time reciting Surah Fatiha gives the reward of 2 Quran E Pak. The reciting of this Surah between the Sunna And Fard of Namaz-e-Fajr 41 times and blow it on water, give it to any patient it will get well soon. It is complete and perfect Dua which Allah himself teach to Muslims. Therefore every Salaah is invalid without it. To conclude, there are a number of Surat Fatiha benefits. It is different from the other chapters of Holy Quran. For seeking guidance from Allah and to get the flavor of Allah, no Surah of Holy Quran is as effective as Surah al Fatiha is.